PORTLAND -- For the second year in a row, partners in A Home for Everyone, a community-wide initiative to end homelessness in Multnomah County, have helped record numbers of neighbors back into housing, find a safer night of sleep or keep from becoming homeless at all. 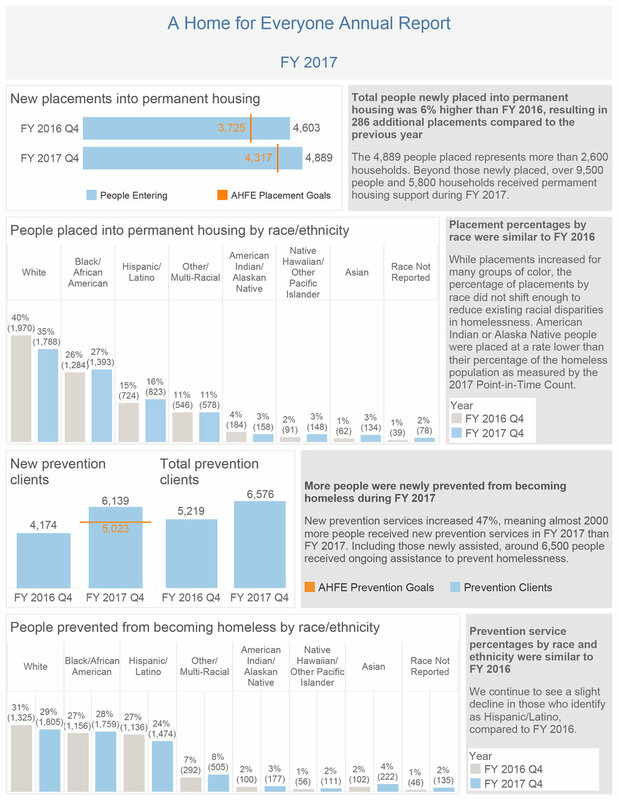 Nearly 4,900 people obtained housing in fiscal year 2017, which ended June 30 -- hundreds more than the goals partners in A Home for Everyone set before the year began. That number is also 65 percent higher than the 2,967 people placed into housing the year before A Home for Everyone launched. In addition, 6,139 people started receiving prevention services last year, almost 2,000 more than the year before and more than 1,000 people beyond what was expected. And 8,532 people accessed emergency shelter in fiscal year 2017, almost 2,000 more people than the record number helped the year before. Two years ago, that number was just 4,760. The year-end numbers were presented at A Home for Everyone’s Executive Committee meeting Monday, Aug. 21. "We have helped thousands more of our neighbors"
Taken together, this ongoing progress shows the difference that unprecedented investments in housing and services have made for thousands of families in need, even as the region’s affordability crisis continues to push people into homelessness and make it harder to escape once they fall. A Home for Everyone launched in 2014. Multnomah County and the cities of Portland and Gresham joined with Home Forward and partners in the faith, nonprofit and business communities to form the region’s most comprehensive and collaborative anti-homelessness initiative. Starting in 2015, working alongside A Home for Everyone, local governments began to dramatically increase funding for homelessness and prevention services. In 2016, Portland and Multnomah County created a Joint Office of Homeless Services to support A Home for Everyone and better align work to provide services. The new data from 2017 shows that partners in A Home for Everyone did what they said they would do -- and more -- when they asked leaders in the City of Portland and Multnomah County to expand their investments and make difficult budget tradeoffs. Since January 2016, partners have delivered on a promise to double the number of publicly funded year-round shelter beds, adding more than 650. The City of Portland and Multnomah County have made shelters far more accessible to people who previously couldn’t or wouldn’t enter shelter.because they live with a partner, did shift work or have a pet. Partners also invested in programs that help people in crisis maintain housing or quickly regain it. Providers have more resources than ever to spend on rent assistance, housing navigation and job training, with new flexibility to help neighbors on the brink. This year, the two governments have committed a record $54 million to the Joint Office of Homeless Services to continue that work. Data from this year’s Point in Time count, released in June, makes clear that challenges remain. Though fewer neighbors were counted sleeping outside, more neighbors overall were counted as homeless. That’s largely because of a widening gap between wages and housing costs in Multnomah County. “We came together to set clear goals, and to agree on what it would take to achieve them. If our partners hadn’t committed themselves to making progress, the crisis in our community would be that much worse,” said Marc Jolin, director of A Home for Everyone and the Joint Office of Homeless Services.